1 Breaking News: Cliff Dixon SHOT Outside Of Atlanta Night Club Celebrating His Birthday! 3 Jimmer Fredette's NBA G League CAREER HIGHLIGHTS with Westchester Knicks! #1 Cliff Dixon Breaking News: Cliff Dixon SHOT Outside Of Atlanta Night Club Celebrating His Birthday! Cliff Dixon, known for dating reality actress Erica Mena and having a close relationship with NBA baller Kevin Durant has passed away. Cliff was celebrating his 32nd birthday last night at SL Lounge in Atlanta where he was reportedly shot. Just hours before, Dixon was promoting the celebration on Instagram, inviting people to join him. Mayor of South Bend, Indiana, Pete Buttigieg, joins Morning Joe for a wide-ranging discussion on everything from the role faith plays in his life and if he's a capitalist to removing money from politics and how being a mayor is good preparation for the White House. CNN)Don't look now, but a(nother) skinny kid with a funny name is turning heads in the presidential race. The reasons for the attention he's drawing and excitement he's creating aren't hard to figure out; He's young, charismatic and personable. He knows how to talk like a regular person -- an underrated trait in a field filled with front-running senators. 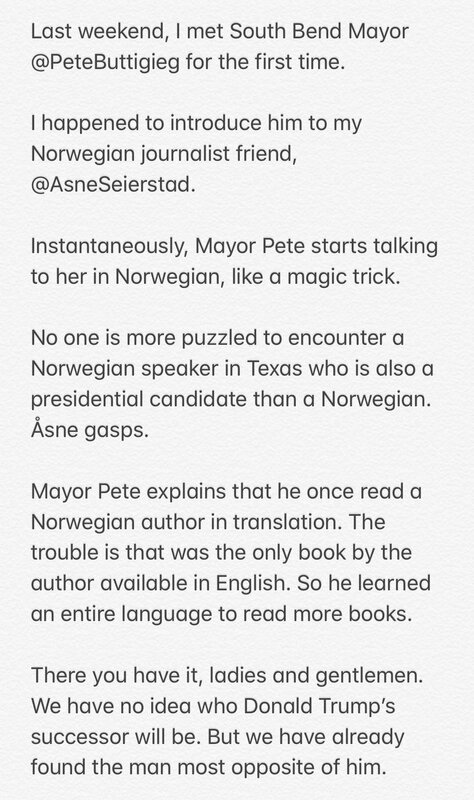 And he has a remarkable resume: Rhodes scholar, military veteran, gay mayor of his hometown.Then there's this: Buttigieg has ZERO expectations about how he will do in this race. When he started running, virtually no one outside of South Bend had even heard of him. When your candidacy isn't weighed down by heavy expectations, you can play fast and loose. You don't obsess over every little thing you say or do. Your every word isn't parsed by the national news media. You can make a mistake (or two) without it being painted as a death blow for your candidacy.And, this: People l-o-v-e a good underdog story. Sure, they might be drawn to the bigger names like Joe Biden and Beto O'Rourke, but Americans will never, ever not be drawn to a scrappy candidate who is charging at the big boys and demanding that he be included in their club. The spunky outsider is in our DNA. And Buttigieg fits that profile to a T.Now. It's March 21, 2019. No one will cast a vote in the primary process for 11-ish months. In that time, Buttigieg's star could burn out. It could wax and wane. (Yes, I am confusing star and moon metaphors -- but you get the idea.) In six months, we might look back and think he had his moment too soon.But Buttigieg is unquestionably having a moment right now. That's something that many people in this field will never have. Or if they do have a moment, it's for the wrong reasons. (Looking at you, John Hickenlooper.) Winning presidential campaigns are those that create -- or benefit from -- positive moments and turn them into something more, a sustainable bid for the highest office in the country.It's not at all clear whether Buttigieg and his team can make that leap. But it is clear that he has a chance, right now, to do so. #5 Jimmer Fredette’s NBA G League CAREER HIGHLIGHTS with Westchester Knicks! Look back at BYU & Chinese Basketball Association star Jimmer Fredette's NBA G League career highlights during his season with the Westchester Knicks! The NBA G League is the NBA's official minor league. Fans can get a glimpse at the players, coaches and officials competing to ascend to the NBA's rank. Justin Carter's family confirms his passing. "His music was his world," Carter's mother, Cindy McClellan, added. "He was always there for everybody." ★ Click to SUBSCRIBE for more awesome! https://www.youtube.com/channel/UCqOmJO0ptmmHrsOnR3oPtTA ★ Thank you for stopping by the channel! If you enjoyed, I try to do videos every day! Country singer Justin Carter died at age 35 after a gun accidentally fired while he was filming a music video. Carters' mother, Cindy McClellan, told Fox News her son was filming a music video in Houston, Texas, on Saturday when a gun in his pocket "went off and caught my son in the corner of his eye. Carter had recently released "Love Affair," featuring Nu Breed. The former ABC cohost says the show was the "most miserable" time of her life and recounts tense incidents with Whoopi Goldberg and Babs. Watch! #JennyMcCarthy #ENews #DailyPop #BarbaraWalters #WhoopiGoldberg Watch Live from E! Jenny McCarthy doesn’t look back at her time on The View all too fondly. In an excerpt published Wednesday by Vulturethis link opens in a new tab of reporter Ramin Setoodeh’s upcoming book, Ladies Who Punch: The Explosive Inside Story of “The View,”this link opens in a new tab McCarthy, 46, characterizes her 2013-2014 stint on the show as “miserable” and goes into detail about working alongside fellow panelists Barbara Walters and Whoopi Goldberg. McCarthy says that heading into the job, she thought she and Goldberg, 63, would be friends. McCarthy says Goldberg, however, didn’t warm to her — and that a divide between the Sister Act star and Walters, the legendary broadcaster who launched the talk show in 1997, was immediately apparent. McCarthy, who compared the dynamic at the table to Survivor, says she ultimately decided to align with Sherri Shepherd since they were both moms to young boys. McCarthy claims Goldberg wouldn’t let Walters moderate and would often interrupt her co-hosts during Hot Topics. McCarthy says she wasn’t going to “play a kiss-a—” with Goldberg. A rep for The View declined to comment. A rep for Goldberg did not immediately respond to PEOPLE’s request for comment. Goldberg got her start in the industry as an actress, nabbing her first Oscar nomination for the 1985 movie The Color Purple. She’s now a rare EGOT winner and has been the moderator and co-host on The View since 2007. She was recently absent from The View for a month after a serious bout of pneumonia put her in the hospital for three weeks. Danielle Bregoli aka Trippie Redd compares him to 6ix9ine after sending text messages. Plus, Daniel Cesar defends Yes Julz in a new instagram live rant. #BhadBhabie #TrippieRed #DanielCaesar Daniel Caesar is getting dragged on Twitter after going off in an Instagram Live video on March 19. #13 Noah Centineo Is In Talks to Play He-Man in ‘Masters of the Universe’ — SWOON! Noah Centineo may have found another reason to get shirtless! ET has learned that the 22-year-old Sierra Burgess Is a Loser actor is in discussions to play the lead role of He-Man in Masters of the Universe. The movie will be based on the beloved Mattel toy line, which spawned a successful animated TV series from 1983 to 1985 and a 1987 film. Mattel Films is in active development with Sony Pictures on the project. The studios had no comment on these reports. The film will likely tell the story of Prince Adam, planet Eternia's heir, who uses a magical sword to turn into the powerful warrior, He-Man. As He-Man, the warrior defends his planet and protects Castle Grayskull -- the source of his powers -- from an evil wizard, Skeletor. In the original film, Dolph Lundgren took on the role of He-Man, while Frank Langella was cast as Skeletor. Brothers Adam and Aaron Nee will direct and write the screenplay. Art Marcum and Matt Holloway will also get writing credits for the script, a previous draft of which was penned by David S. Goyer, who will nab an executive producer credit. Escape Artists' Todd Black, Jason Blumenthal and Steve Tisch will also produce the project. The news of Centineo's new project comes on the heels of the announcement that he is currently in production for the follow up to Netflix's 2018 hit, To All the Boys I've Loved Before. This year, Centineo will also star alongside Camila Mendes and Laura Marano in Netflix's The Perfect Date, which is due out Apr. 12, and then take his talents to the big screen, appearing alongside Kristen Stewart, Naomi Scott and Ella Balinska in Elizabeth Banks' upcoming Charlie's Angels reboot. When ET Live's Denny Directo and Cassie DiLaura caught up with the actor back in November he gushed about Charlie's Angels' leading ladies. "They're very loving people, " he raved. "We were filming in Germany and Turkey, and as soon as I got there, they're like, 'What's good, man! Want to hang out?' I was like, 'Yeah, for sure!'" He added, "They're all lovely, deeply talented, dedicated individuals." Theo Von is one of the funniest comedians working today. You can catch him on the Dark Arts Tour coming to a city near you. His special, No Offense, is on Netflix now. And he has a podcast, This Past Weekend, which is available on Apple, Spotify, YouTube, and wherever else you get your pods.